Colorado Springs, Colo. (AP) – Some runners didn’t expect to see a bear on their Colorado race route. 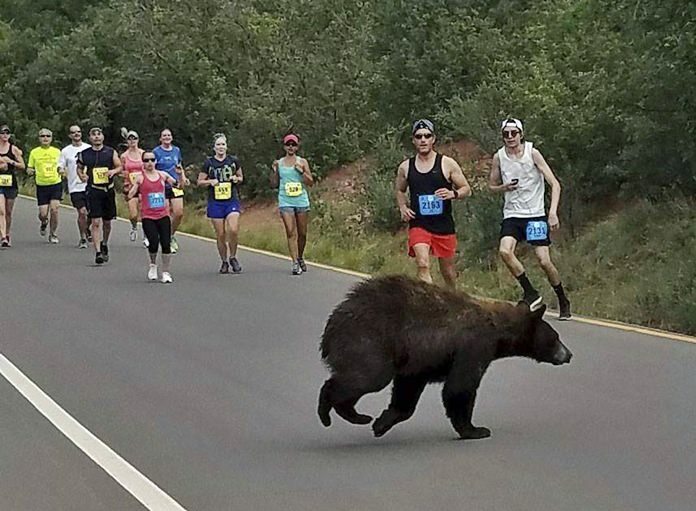 Donald Sanborn says he was about 5 miles into the Garden of the Gods 10 Mile Run on Sunday when the bear ambled across a roadway near Colorado Springs. Sanborn says the animal seemed to be trying to decide whether to zip across the road filled with runners when a large enough gap finally emerged for the bear to get through. He says he’s encountered bears, elk, turkeys, bobcats and other interesting wildlife on training runs, but hasn’t seen an animal like this in a race. The competition winds through Garden of the Gods Park between Manitou Springs and Colorado Springs. Jonesboro, Ark. (AP) – Officials in an Arkansas county have a plea for courthouse visitors: Please stop urinating in our elevator. Craighead County officials hope new security cameras will deter the steady stream of culprits who have been relieving themselves in the courthouse elevator in Jonesboro, a college town about 115 miles (185 kilometers) northeast of Little Rock. Maintenance workers say the problem has persisted for years – even though the restrooms are only about 25 feet (8 meters) from the elevator. Officials tell The Jonesboro Sun that the cameras, installed last fall, have caught three men in the act, one of whom has been cited for disorderly conduct and fined $105. A third instance was recorded Monday, and county officials say they plan to issue a citation. Berlin (AP) – In a cross-border cultural mix-up, authorities say a little French girl was found alone, crying in the playground of her school in Germany after her parents forgot it was a holiday in the neighboring country. Police said the 5-year-old’s parents dropped her off early Thursday at the German-French school in the border town of Kappel-Grafenhausen but they had forgotten Corpus Christi was a public holiday in the Catholic-majority state of Baden Wuerttemberg. A neighbor found the girl and looked after her until police were able to contact the school administration to arrange for someone to watch her until the parents came and picked her up. Berlin (AP) – A German snack bar owner is preparing for the worst – or is it wurst – in a spat with authorities over the sale of sausages at a highway rest stop. Christina Wagner has been battling to sell bratwursts by the Autobahn near the town of Rodaborn for years. Authorities refused to give Wagner a permit to operate at the site, so she passes sausages to her customers through a fence from an adjacent lot. The case has made her a local celebrity and thousands of people have signed a petition in her support. German news agency dpa reported Thursday that authorities in Thuringia state are now threatening to issue Wagner with fines until she stops selling sausages. But Wagner says she’d rather go to prison than pay. St. Petersburg, Russia (AP) – Russia’s famed Hermitage Museum has chosen one of its resident cats to predict the results of an upcoming international football tournament. From Saturday to July 2, Russia is hosting the Confederations, the main warm-up event for next year’s World Cup. St. Petersburg’s Hermitage Museum on Thursday unveiled Achilles, a white moggy who will be offered two different plates before each game to predict the Confederations Cup results. The Hermitage is currently home to some 50 cats which live in the museum’s cellars and catch mice. Cats were introduced to the Hermitage, then the imperial Winter Palace, by Peter the Great in the 18th century. Catherine the Great officially made the cats guards of the royal picture gallery.